No matter where you belong, no matter what your religion is; there is nothing more auspicious than tying your knot with the one you love; the one you are destined to be with for the rest of your life. But what makes your nuptial more aesthetic is the wedding customs associated with it; traditions, which are believed to carve a canvas of eternal joy to the most beautiful festival of your life. So robust are its roots that even the most non-traditional couples happily take part. From the bride tossing her bouquet or the customary kiss to the father spitting on her daughter’s head, customs vary from romantic to perplexing. Here I have tried to compile ten of the fascinating concepts surrounding marriage from far, far beyond your backyard. While some may appear weird, trust me, I have tried to keep it as beautiful as possible that are sure to charm you and bring a smile to your face (feel free to adopt some of these!). However, I could not help pointing a few of them, which deserves to be rubbed out fast, very fast. Yes, being a Filipino is fun; especially when the country has such lovely wedding customs like releasing a pair of white doves into the air. Doves, they say, are a symbol of true love. The couple thus releases two doves high so that they can enjoy a harmonious, peaceful and a long-lasting marriage. The country has other beautiful customs from cake slicing and wine toasting to the couple’s first dance! This is one custom I’ll definitely adopt! Who would not love having the traditional Kransekake, the ring cake towered on a bottle of wine? Mouth-watering, huh? Yes, Norway is one of the best places to get married! From delicious delicacies to traditional costumes (brides wear silver and gold tiaras while the groom, a woolen handmade suit! ), they celebrate wedding like none else! 3. Romania-Wife is abducted! Wait, What? No, don’t worry. It is just a mock abduction where the bride is kidnapped by her close ones while the groom must come to her rescue. In order to get her back, the groom must pay the ransom amount in the form of drinks or even romantic gestures! Sounds fun, right? 4. Niger- Dance like none other! Tired of watching your fellow guests dancing (or trying to dance!) on that evergreen ‘Naagin song’? As it turns out, Niger has its own special guests in the form of camels! Yes, you heard me right. Camels rise to the occasion to ‘shake their humpback’ onto a rhythmic drumbeat as they entertain the surrounding guests in the reception! 5. Germany: So you think you are strong? In this unique tradition, the bride and groom are required to cut a log together in front of their guests so that they can showcase their bond. It is believed that by proving their ability to work together they will be fare better in their journey of life through their ups and down. This one is hard to understand though. Now, which father would want to spit on her daughter’s head on the day of her wedding in her lovely wedding dress? Such is the strength of beliefs and convictions that it is still practiced in many of Kenya so that the couple enjoys good fortune in the near future. Gross. That’s the appropriate word. Imagine cutting chickens and keep on cutting until you find a good liver! And that’s the way you are to decide your wedding customs date. And we Indians thought that our pundits were strange as they let the stars decide our wedding day! A Jamaican wedding is basically a community event disguised as a marriage ceremony where the entire village gathers up and misses no opportunity to criticize the bride publicly lest she is in tip-top shape. The place where the confetti actually originated. However, confetti is much more than colorful pieces of paper thrown around. In Italy, a tray of confetti, a sugary treat (usually sugary almond), prepared by some close acquaintance in the family, is thrown at the couple to bring good luck. The objects of the tray represent health, fertility, and wealth. 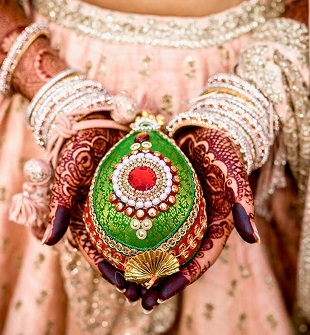 I couldn’t help writing about our very own, the big fat Indian wedding. 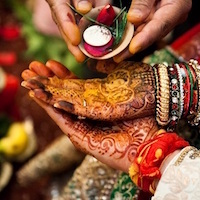 Leaving aside traits like dowry, Indian weddings are one of their kinds. 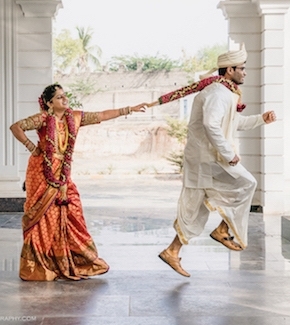 With fun customs like ‘shoe-stealing’ of the groom to ceremonies like the ‘sangeet’ and ‘mehendi’, these weddings Customs are a ‘must-attend’ for anyone. The best part? The intricate henna designs, which run as deep as love, making them the best tattoos in the world.